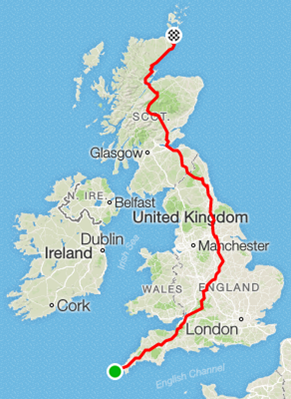 Our cycling challenge covered the distance of a simulated bike route from Land’s End, at the southwestern tip of England, to John O’Groats, at the northeastern end of Scotland. On Oct. 10 last year, we held a cycling event to raise money for a charity called Haven House that built on a similar cycling event we held for Haven House in 2015. For that 2015 event, five members of our London office completed a 100-kilometer (60-mile) bike ride from London to Cambridge in which the team solicited sponsorship donations to raise funds. For our 2016 event, our idea was to expand our participants to as many employees from the London office as possible. To do this, we decided to use a stationary bike and recruit our office colleagues to ride the distance of a simulated route from Land’s End to John O’Groats in four weeks’ time – an incredible 1,500 kilometers or 932 miles! The bike was placed in a quiet room in our office, where everyone could stop by whenever they had time and clock some miles for as long or as far as they wished. Each participant solicited donations from family members, friends and colleagues to support her or his part of the race, and we created our own team blog to report our progress. 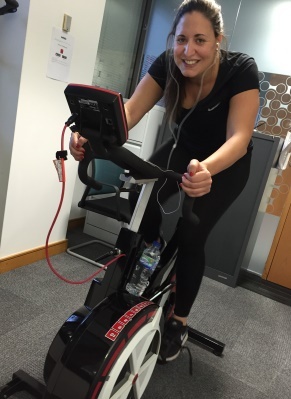 Paula Benito Claramunt, Customer Success Manager, pedals for Haven House at our London office. Haven House, a children’s hospice that our office has been supporting for a couple of years now. This charity provides a variety of support services for children with life-limiting and life-threatening illnesses and their families, including convalescent care, end-of-life care and specialist day care for preschool children. It has also been selected again by the London employees as our chosen charity for 2017. A total of 30 employees took part, and they logged a total of 147 sessions, or legs, for the trip. To encourage healthy competition, we updated our team blog with our progress each day and included a leaderboard, and we also sent a weekly email update that complemented the blog and further drove interest. Claudia Nache, Customer Service Specialist — 280.76 kms. John Lloyd, Senior Human Resources Manager — 266.43 kms. Michael Bradford, Technology Director, Enterprise Solutions — 141.57 kms. Derek Corcoran, Manager, Customer Operations — 137.70 kms. Paula Benito Claramunt, Customer Success Manager — 135.58 kms. Nerijus Gedvilas, Advisory System Engineer Support Specialist — 115.11 kms. Jawad Ait-Iddir, Customer Service Specialist — 101.90 kms. All in all, we completed 1,679 kilometers (1,043 miles) in four weeks and raised £3,347 (approximately $4,030), which included a matching contribution of £1,500 (approximately $1,800) from our London Employee Association. What’s more, because Haven House was selected again by the London employees as our chosen charity for 2017, and because we managed to raise enough money to support the operating cost for an entire day at Haven House, we are able to choose a day in 2017 when the charity will promote Syniverse as its sponsor for that day! What was the single most rewarding part of this activity for you? First and foremost, it has to be Haven House charity and the fantastic work it provides to life-limited children and their families. In 2015, I first was drawn to participating in a bike ride to support Haven House because I’m an avid cyclist myself. We then invited Haven House to come to our office and describe more about its work, and all of us who attended were touched by it. A second rewarding part of our Land’s End-to-John O’Groats bike ride has to be the way that a majority of employees from the London office joined in the challenge. I was really amazed at the effort so many of them put into the challenge and how little urging was needed to achieve our target. 😉 In fact, the challenge was such a success, we’re planning to coordinate a similar event this year concurrently with other Syniverse Employee Association groups worldwide. Watch this space! Siegfried Bonhomme is a Senior Advisory System Engineer and works at Syniverse's London office.